Over the course of this summer I had the opportunity to lend a hand to some of my former Willowbank classmates, in working on the restoration of a small but important heritage building from the early 1890’s. 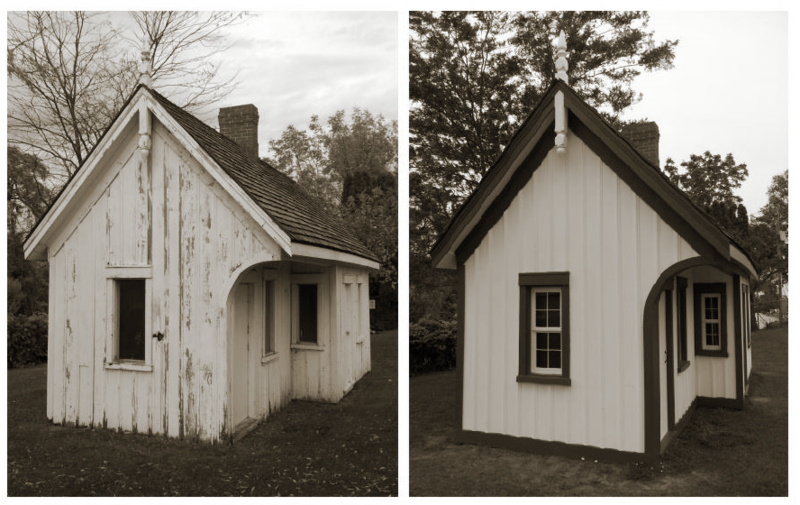 This unassuming building, looking very much like an oversized garden shed, is the last remaining Lock Tender’s Shanty from the Third Welland Canal (1887 – 1932). This shanty is located next to Lock 1 of the 3rd canal, and would have provided shelter to the canal employees who operated the lock, collected fees, and kept records of the ship traffic as they entered and exited the Lake Ontario side of the canal at Port Dalhousie. I was surprised by how much original material was left of the building, after it had undergone some past restorations in 1989 (done by high school students), and again in 1999. The biggest issue the building had, as is common with many buildings, is water. The site is very poorly graded for drainage, with water running directly into the side of the building. Over the years the level of the ground has raised putting the bottom of the walls in direct contact with the ground. Grounds maintenance people have not always been careful when operating string trimmers (‘weed whackers’), causing additional damage to the wood near the bottom of the walls; and lastly carpenter bees had drilled many, many perfect holes in the wood too. The restoration work involved cutting the bottom of all of the walls and installing a skirting board. Replacing a few rotted or missing boards and battens, and repairing others. Ensuring the building was properly weatherproofed (flashings, caulking, fresh paint). A few missing architectural details were also reintroduced based on historic photographs. My role was quite small, a little wood working, some caulking and painting. But it was nice to be able to get hands-on with a heritage building again. I’d missed that sort of thing after leaving Willowbank. It was wonderful to see my good friend (and recent Willowbank graduate) Mike Barneveld of Square Peg Restorations working in his new element, as the lead-hand and acting project manager on the restoration. He did the vast majority of the work, and did an amazing job. Well done Mike!